This releases introduces a set of CSS themes that are built into the .js library. It is no longer necessary to include an external stylesheet in order to display the control correctly. You can still use another theme using .theme property - either one of those that are included in the DayPilot package (Transparent, White, Green, Windows 8, Blue, Traditional) or a custom theme built using the online CSS theme designer. 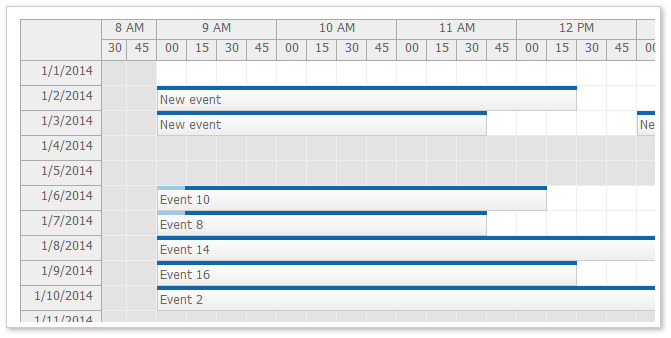 The default scheduler CSS theme uses gray header background, white cell background, light gradient for the event background and shades of blue for the duration bar (highlighting the). Resource tree node icons (no children, expanded, collapsed) are included. Special classes for floating scheduler time headers and floating events are included (a special overlay for objects that are not fully visible due to the scrollbar position). 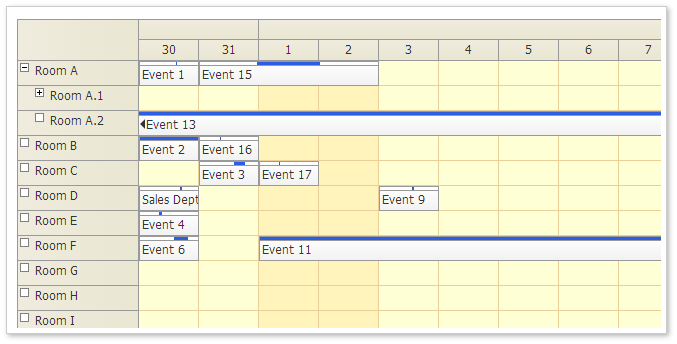 The default Gantt chart theme reuses the Scheduler CSS theme. The percent complete indicator uses the duration bar style (blue bars at the top of the task). The default Timesheet theme reuses the Scheduler CSS theme. Weekend and other non-business hours use a special background color (light gray). 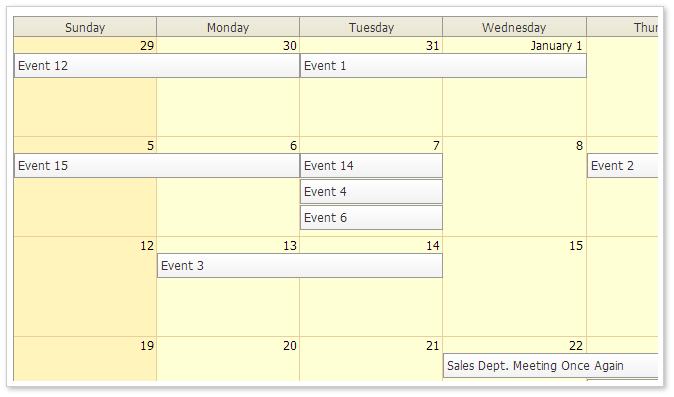 The event calendar theme uses rectangular corners a light CSS3 gradient for event boxes. The duration bar is displayed on the left side, using dark and light blue to indicate the real event duration. All day events use a simple box with a light gradient. 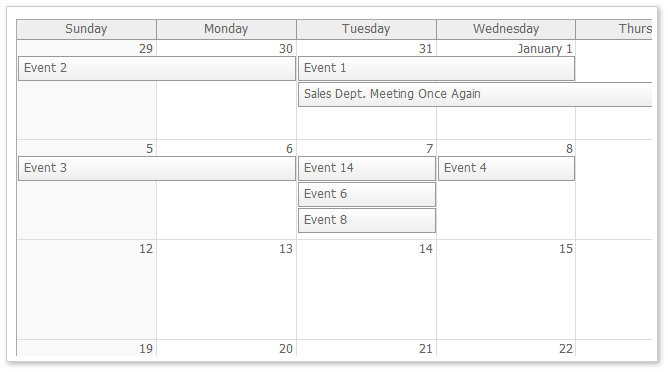 The default monthly event calendar theme uses a CSS3 gradient for event boxes. Weekends use a light gray background color. 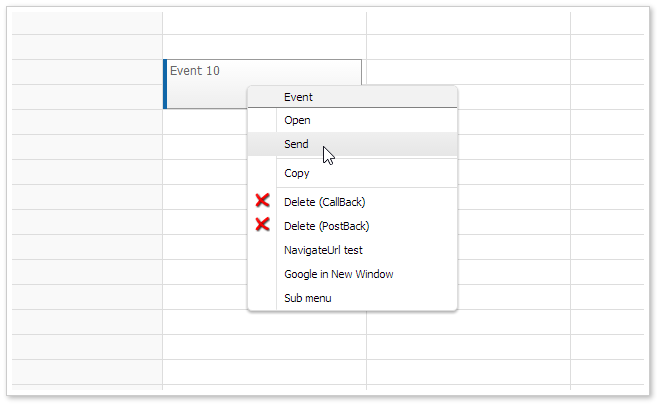 The event bubble displays event details in a hover box. It is a simple box with gray text and gradient background. It uses rounded corners to give the bubble a look different from the event boxes. 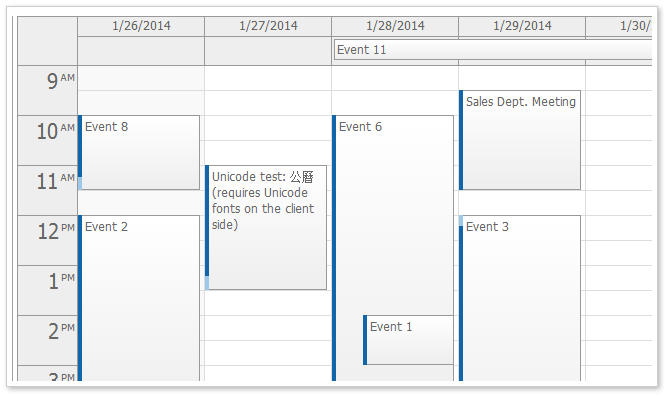 The navigator displays an outline of one or more months and allows the users to change a date displayed in the main HTML5 calendar widget. The default theme uses a combination of white, black and gray. The selected date range is highlighted using a yellow background. The current date is highlighted using a red border. 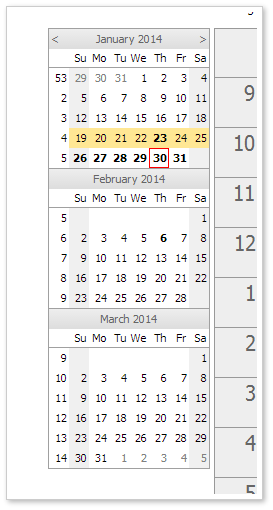 The date picker uses the navigator_default theme (it is based on the Navigator). It is possible to specify how the cell (column) width will be set using a new .cellWidth property. The previous version always used the value specified using .cellWidth property. With 7.7 release, it is possible to adjust the cell width according to the current viewport size so the total width will match the Scheduler widget width. The default mode uses .cellWidthSpec="Fixed". You can use cellWidthSpec="Auto" to adjust the cell width automatically so the full Scheduler width is used. No free space on the right will be displayed. No horizontal scrollbar will be displayed. The .cellWidth property will be overwritten during the adjustment. It may use a decimal number. The width will be recalculated when the browser window size is changed (window.onresize event). These themes are based on the traditional DayPilot look (in !CssOnly mode). You can use them as a starting point when switching to CssOnly mode. The themes were created using the online theme designer and tweaked a bit (the duration bar border in calendar and scheduler was added manually). The default moveBy value is now unified. All widgets (Calendar, Month, Scheduler) use moveBy="Full" by default. The boilerplate required for widget initialization is reduced. All widgets include a default CSS theme. If you want to start with the default look, there is no need to include a stylesheet with the theme and set the cssClassPrefix/theme value. The default values are adjusted so they work with the CSS themes without further tweaking. This includes the default values for .eventHeight, .moveBy, cellWidth. The ToolTip is automatically turned off when bubble is activated. In the previous versions of the Scheduler long events were difficult to read because the text was hidden. 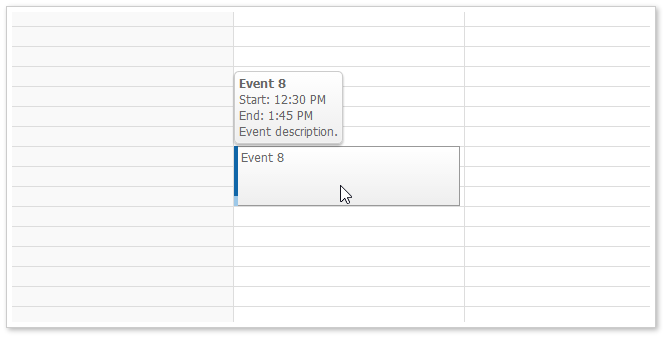 If the beginning of the event is not visible (for long events than start in the past) it displays a special floating div over the event that displays the event HTML. Read more about floating events in the documentation. 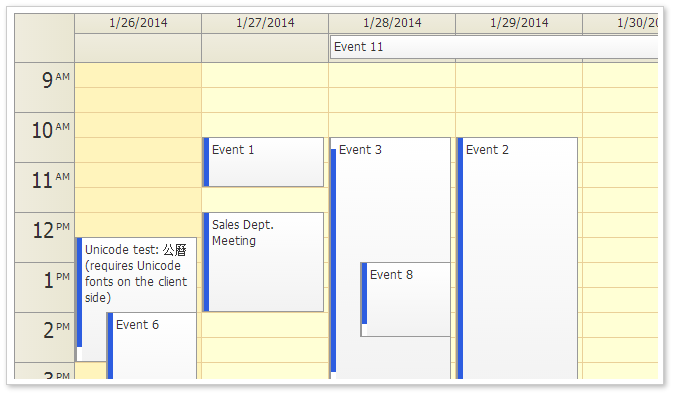 In the previous Scheduler version long header cells were difficult to read because the text/HTML was hidden. If the beginning of the header is not visible (for long headers, especially month and year time header groups) it displays a special floating div over the time header cell that displays the event HTML. Read more about floating time headers. You can specify selection dimension properties in the CSS. This is helpful if the CSS is designed to work with different than default dimension. It will soon be added to the online theme designer as well. This CSS value will override the value specified using the calendar object. Replace the asterisk with the theme name. When dragging an event over a row that has child nodes it is automatically expanded after a short delay. The business cells are marked with a special CSS class. This class is not applied when you use .drawBlankCells = true and don't handle .onBeforeCellRender event (for performance reasons). The navigator allows highlighting busy days.